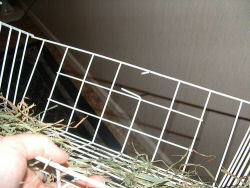 Tweak's head, neck and one front leg were wedged in the hinge area of a Super Pet Hay Manger; the wire had to be cut to remove her safely. Remember to use only the 9-squares-across grids for building your C&C cage. The new Organize-It brand of grids is 8-squares-across, and is not suitable for cage building. There have been tragic accidents with this new larger grid design. Sadie gets her head stuck inside an undershelf hanger that was being used as a hayrack. Periodically check the bindings of any blankets used in cages for loose threads and gaps. Periodically check the connectors and zip-ties on your C&C cage. 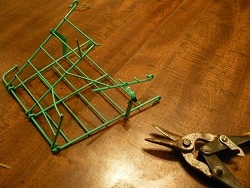 Use heavy-duty zip-ties when building cage tops and multiple levels to ensure maximum safety. The dangers of placing a guinea pig in a pet carrier in the front seat of a car. Guinea pig becomes trapped inside a hay dispenser. When using cardboard tubes, remember to slice them lengthwise.